Toronto is one of those cities you can visit again and again and get a different experience each time. So while 36 hours isn’t a lot of time to explore a destination, it can give you a good taste of what a city has to offer. And when it comes to Toronto, 36 hours is usually enough time to inspire a return visit. The vibrant, multicultural city has so much to offer no matter what type of traveller you happen to be, whether you’re into nature, food, arts and culture, history or shopping. Toronto is also easy to get around via public transit, bike rental or on foot depending on where you’re exploring and how far you need to get. If you only have 36 hours to spend on Toronto, read on for some suggestions for what to see, do, eat and drink. Check in: Finding a place to rest your head in Toronto isn’t difficult, no matter your budget or preferred style of accommodation. For a boutique experience at a hotel where there’s always something happening, head to either the Drake Hotel or the Gladstone, both in Toronto’s West Queen West ‘hood. 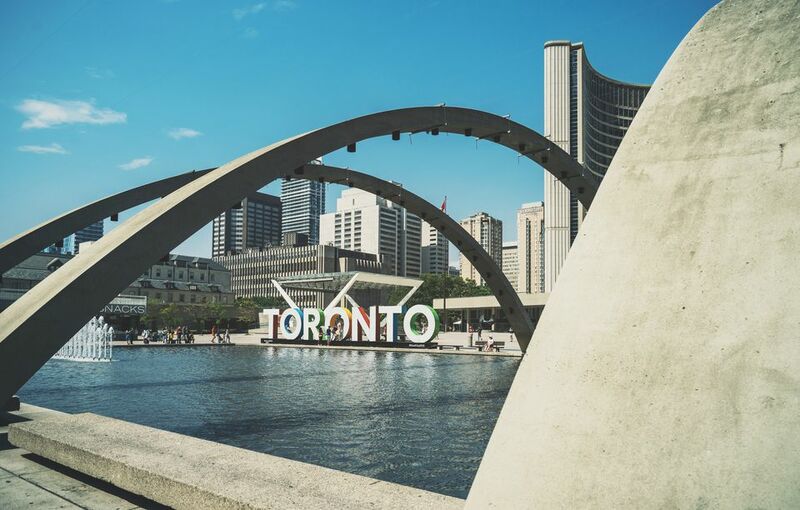 A good central option is the Sheraton Centre Toronto Hotel with it’s year-round indoor/outdoor pool, or the Delta Toronto just steps away from many of Toronto’s top attractions. Kick it around Kensington Market: One of the best ways to get a real feel for just how multicultural and eclectic Toronto is, is with a visit to Kensington Market. Spend the late afternoon exploring the mash-up of vintage clothing stores, Latin American eateries, cheese shops, colorful produce markets, delis, spice markets, bars and cafes. Cheese-lovers should definitely make a pit-stop in sprawling Global Cheese where knowledgeable, fast-moving staff are more than happy to dole out multiple samples of whatever cheeses pique your curiosity. For a proper meal make your way to Seven Lives for their much-loved Baja fish tacos or opt for a coffee and a house-baked pastry from Swedish spot FIKA Café. Check out Chinatown: Toronto is home to one the largest Chinatowns in North America and if you have time after exploring Kensington Market, make your way to the nearby corner of Dundas and Spadina to take in the sights and sounds of the many tightly-packed produce stalls, markets, shops selling Chinese herbs, bakeries and East Asian eateries. Tapas – and then mezcal: Toronto chef Grant van Gameren can so far do no wrong. Every bar and restaurant he’s opened or been part of recently (and he’s on quite a roll) has really hit the mark. Do dinner at one, and then stop for drinks at another, the two spots in question being Bar Raval on College St. and El Rey Mezcal Bar back in Kensington Market. Bar Raval serves flavorful tapas in an intimate setting where you’ll likely find yourself leaning against the bar while you eat and drink (kind of like you would at a traditional tapas bar in Spain). Once you’ve had your fill, get yourself to El Ray for a sip of mezcal, of which there are an evolving roster of 30+ to choose from. If you’re not sure which one to try, you can sample a flight. El Ray also serves some unique cocktails, which change with the seasons. Caffeinate: The area around Dupont and Lansdowne, west to the Junction and south to Bloor St. is fast becoming the city’s newest up and coming ‘hood courtesy of a spate of cafes, restaurants, bars and art galleries opening up. Start your tour with a coffee at Hale Coffee Company on Campbell Ave. They roast all their beans in-house and serve up great coffee in a large but welcoming space. If you're visiting during the warmer months, sip your beverage of choice in one of their Muskoka chairs out front. Or if you prefer something sweeter, head further west to ultra-friendly Café Con Leche for their decadent Nutella latte. Gallery hop: Dupont St. is home to a growing number of art galleries. Depending on what day of the week it is (since not all galleries keep regular business hours) you can spend a couple of hours checking out some contemporary art by both local and international artists. Several galleries in the area showcase emerging and established artists working in a variety of mediums. Add Angell Gallery, Erin Stump Projects, Cooper Cole, PM Gallery and Clint Roenisch Gallery to your art-hopping itinerary. Afterwards, refuel at rustic Italian bakery Mattachioni (open all day) with a panini and an espresso, or get a hearty sandwich, burger, or salad from ultra-cute Tuck Shop Kitchen. Take a brewery break: Toronto is having a mega craft beer boom and many of the best new breweries can be found in the city’s west end. If you’re a beer fan it’s well worth spending an afternoon brewery-hopping since you have so many great options to choose from. Some of the best bets include Halo Brewery tucked away on Wallace Avenue in the Junction Triangle, Bandit Brewery on Dundas St. near Roncesvalles, Henderson Brewing Co. on the West Toronto Rail Path and Blood Brothers Brewing hidden on industrial Geary Ave.
More beer, plus pizza and arcade games: If you haven’t had your fill of beer with a brewery-hop, make your way back to Geary Ave. (if you visited Blood Brothers) and find a table at cavernous The Greater Good, a one-stop shop for craft beers, delicious pizza and old school arcade games. Head up to the bar for a pint of local beer and then order up a slice or a whole pie from the on-site North of Brooklyn pizza kitchen which turns out perfectly blistered thin crust pies for either dining in or taking out. The arcade games on the second floor are all free to play save for if you want to try your luck at skee-ball. Explore St. Lawrence Market: A trip to Toronto can only be made better with a visit to historic St. Lawrence Market. Start by grabbing a Montreal-style bagel with cream cheese from St. Urbain Bagel to fuel your exploration through the foodie paradise. The sprawling market landed in top spot in National Geographic’s 2012 list of the world’s best food markets and there is a lot of food to eat your way through, or just browse depending on your mood (and hunger level). From cheese and fresh-baked bread, to produce, prepared goods and snacks, you won’t go hungry here. Discover the Distillery District: Assuming you’ve got a bit more time before bidding adieu to Toronto, head from the St. Lawrence Market to the Distillery District to wander car-free, cobblestone streets among Victorian-era buildings. Here you’ll find art galleries, studios, cafes, restaurants and unique shops to check out. Treat yourself to some seriously addictive artisan chocolates from SOMA before you leave.